We met out on Selwyn Road; the part of Selwyn that is on the north side of the Island Highway behind the Millstream Village Shopping centre near Home Depot in Langford. There is a trail marker about half way down the road on the left that leads into the trails. We first tried the right hand trail just to see where it would take us, but after a few hundred yards it came back up on Selwyn Road. We walked back and took the left hand trail that walked to where it crosses Treanor Ave. and kept walking between the school yard and the creek. It goes on and on and comes out at the end of Phelps Rd. and we found the trail at the end of that cul-de-sac that took us the the far end of this trail where it crosses a very old iron footbridge that I believe was once a boarding gangway for a steamship. At this point we turned around and walked back to the beginning of the trail again. Due to construction work on the Millstream Road overpass at the highway we all had to drive all the way out past Langford lake on the new McCallum Road extension to Leigh Road and double back to Goldstream Ave. where we went to the Brown's Social House for lunch. On a rainy day the CanRamblers head out into Tower Point Park. 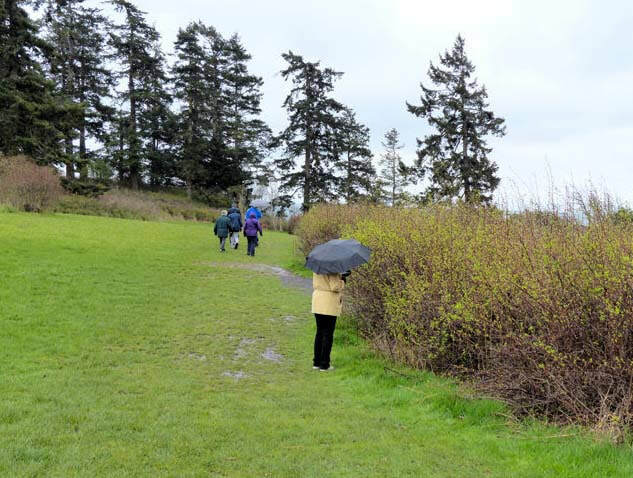 On a rainy Spring day we ventured out to Tower Point Park, which is part of Whitty's Lagoon Regional Park. 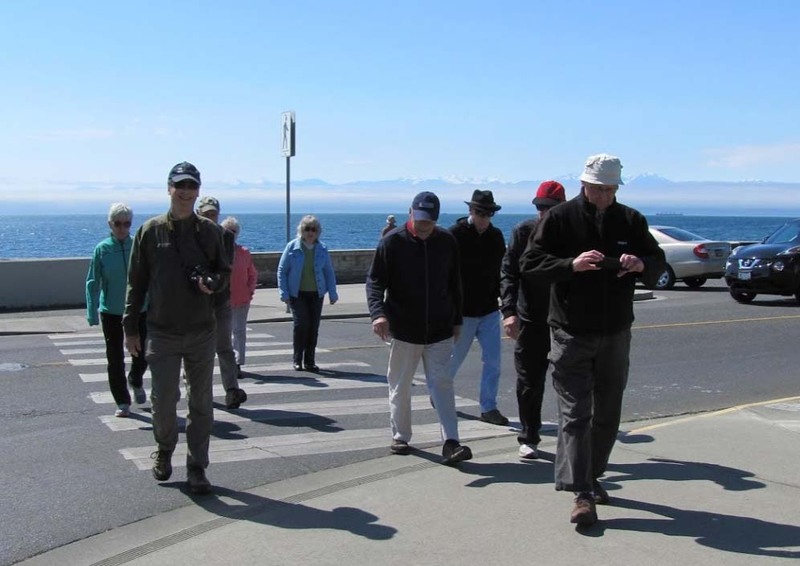 In a steady and cold breeze this small group of CanRamblers walked around the perimeter of this seaside park. The sea views are very pretty, but it was just too wet for any of us to really enjoy the walk today. maybe we'll come back here in the summer and spend more time enjoying the scenery. We also stopped at St. Mary's Anglican Church to see if the church yard was filled with Easter Lilies as it has been in years past. To our disappointment they lilies were not all out yet. We headed back to the Rose Pub in Langford for lunch. 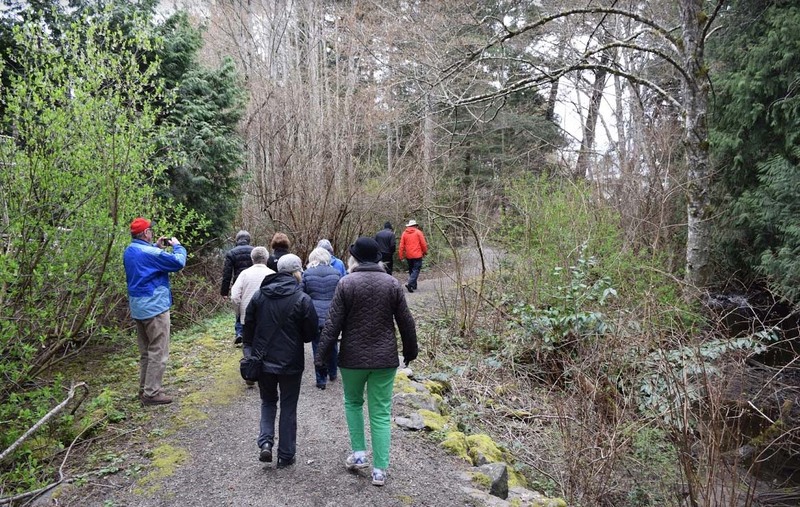 The CanRamblers explore the beauty of Gore Park near Brentwood Bay. The CanRamblers drove out to Gore Park which is near Brentwood Bay. The entrance is through a path between two high hedges at the very end of a cul de sac. The trail system is basically a circle route with a few additional trails that weave in and out through the forest. See the trails map in Terry's photos. It's an easy walk with a few rock outcrops to get up and over. We chose to visit this park in the spring to see the wildflowers. We were not disappointed. Drive out Keating Crossroads to Benvenuto Ave. then turn right onto Amwell Dr. and turn right to find Losana Pl., the second street to the right. The trail starts at the end of this short road. We saw most of the park in just over a half hour. Then we made our way out to the Prairie Inn for a nice lunch. This walk wasn't in any way a cardio focused walk, but in view of several people who had knee joint issues I thought that it would be better to make this walk a leisurely stroll around the park to remember and re-discover some of the history and changes of the park features. As there are so many nice flower beds that are coming out with their spring blossoms it was nice to see those too. I hope that everybody enjoyed their lunches at the Beagle. Susan tries very hard to give us good service at that pub. 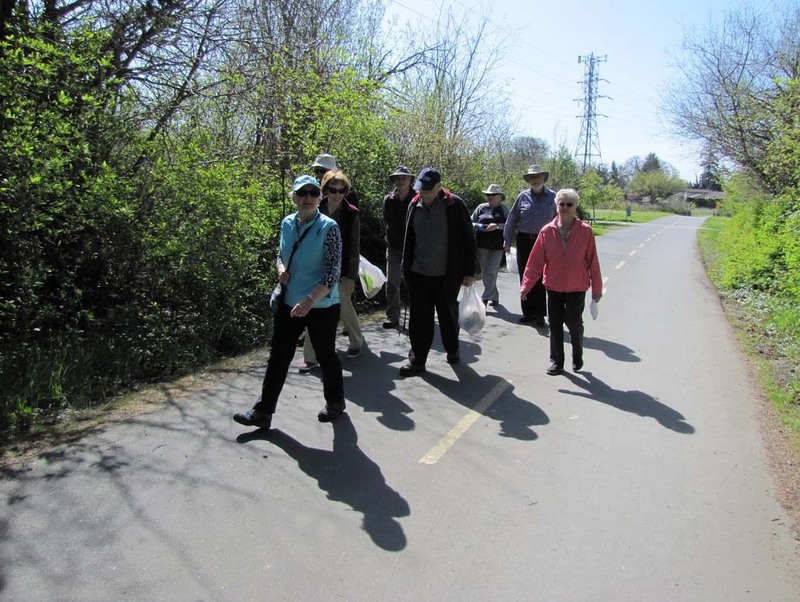 The CanRamblers set out to do a clean-up on the Lochside Trail. On a beautiful sunny day that felt like summer; we met at the end of Lochside Drive just beyond the Monkey Tree Pub and started to pick up litter along the side of the trail. We walked for about a half hour towards the Royal Oak Drive end and turned around and picked up trash on the opposite side of the trail on the way back. To our delight there wasn't as much trash as in past years. Perhaps since we were only a few days past Earth Day some other persons had done a clean-up. We did find about two bags full of trash though. That made us feel that we had accomplished something worthwhile. We went to the nearby Monkey Tree Pub for lunch. The Taco specials were popular that day. 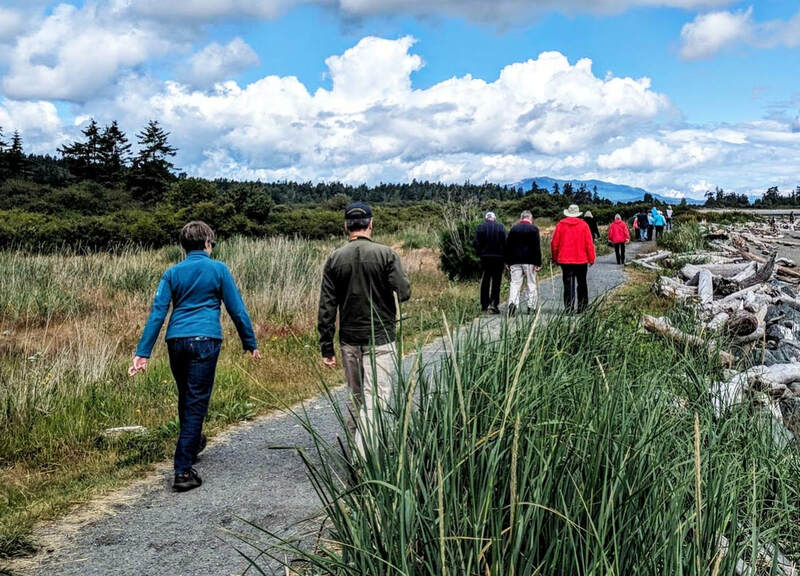 Setting out to walk along the Esquimalt lagoon beach to see the driftwood art. It was a perfect day to visit the Esquimalt lagoon. There was almost no wind and the sun was bright and almost summer-like. Our purpose as always is to get some good walking done in a natural environment and the recently placed driftwood art by Paul Lewis was a real bonus. There were lots of other people there to see these driftwood creations as well. We parked quite a way away and did a 2.5 kilometer round trip walk today. I hope that vandals leave these driftwood birds alone for all to enjoy. Hats off to Mr. Lewis for his creative donations to this beach. 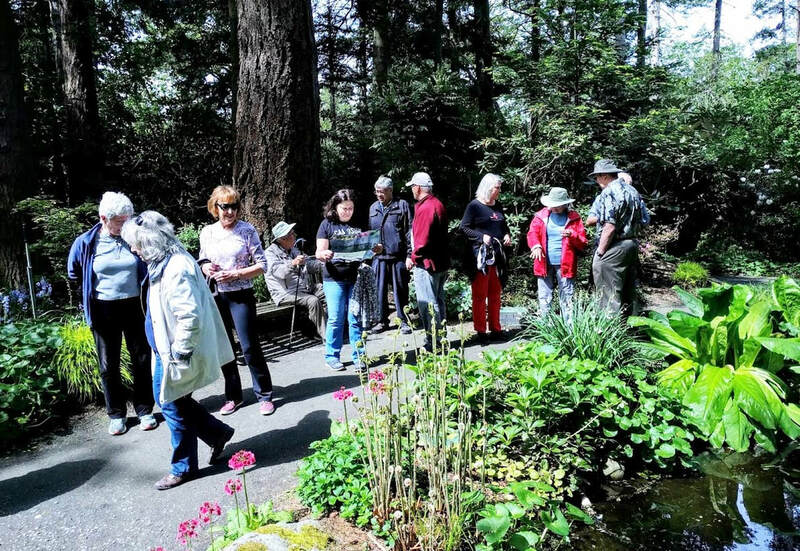 We had a good turnout for this walk in the Finnerty Gardens. The morning started off with a few showers, but by the time of our walk the sun was out and it became a warm and sunny day. We parked along Cedar Hill X Roads near the Henderson Rec Centre and walked along the path at the edge of the university grounds to the entrance to UVic. There is a cross walk that takes you right to one of the entrance gates into the gardens. We explored the pathways and enjoyed all the flowering plants and ponds. After about an hour we headed back to our cars and drove the short distance to the Smuggler's Cove Pub for a nice lunch. Starting out at Dallas Road. It was a wonderful day for a walk through much of Fairfield starting at Dallas Road near the Ross Bay Cemetery and turning off on May Street. We walked parts of May Street, Moss Street, Oscar Street, Linden Street, Howe Street and Point street before getting back to where we parked. We saw lots of beautifully restored and maintained historic homes and gardens. A nice breeze off of Juan De Fuca straight kept us cool as we got nearer to the waterfront. Claudia had foot problems and turned back towards the waterfront and saw a hang glider. She got some nice photos of him up close. A nice lunch at the Ross Bay Pub finished the 3.76 km walk. Thanks to Phil for organizing and leading this walk. 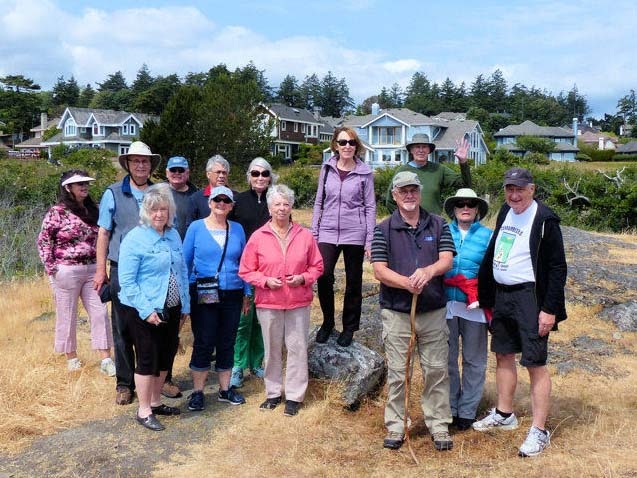 The CanRamblers met at Cattle Point and walked into the Uplands Park at a trail right across the street from the place where we parked. It was a very nice day for a walk through this large natural park. At Midlands Road on the other side of the park we headed into the Uplands Estates residential area. For those of you who don't know this area very well it is an exclusive area of multi million dollar homes and lush gardens. The streets are narrow and shaded by many large oak trees and there is very little traffic. We passed quite a few huge mansions that are under construction or renovation. We walked as far as the place where Midlands Rd. meets up with Beach Drive and then headed back along Beach Drive to Cattle point and our cars. For lunch this time we drove down to Willows Park and met up with a few of our members who were saving us a picnic table. Some of us brought a lunch from home; the others bought food from the Kiwanis Tea Room concession. It was a long tiring walk in that heat today. Over 8400 steps in just over 80 minutes. 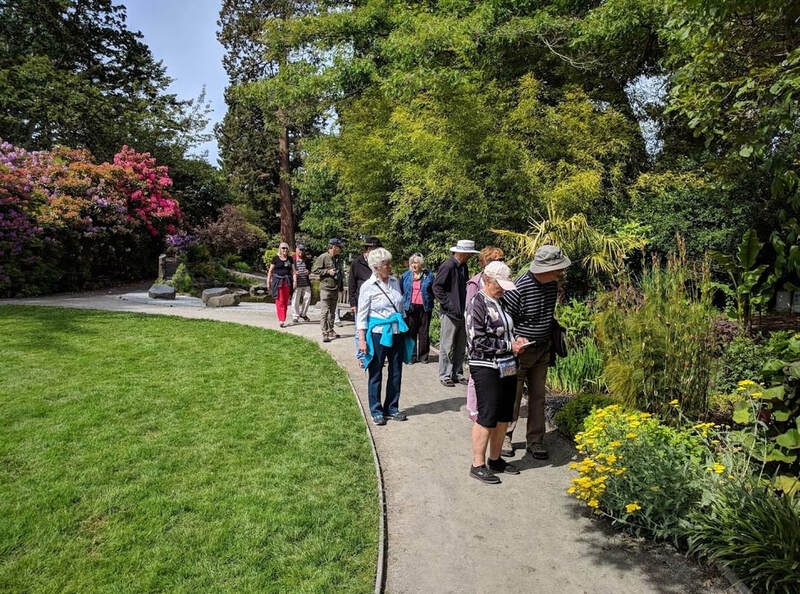 The CanRamblers walked through most of the Government House Gardens. 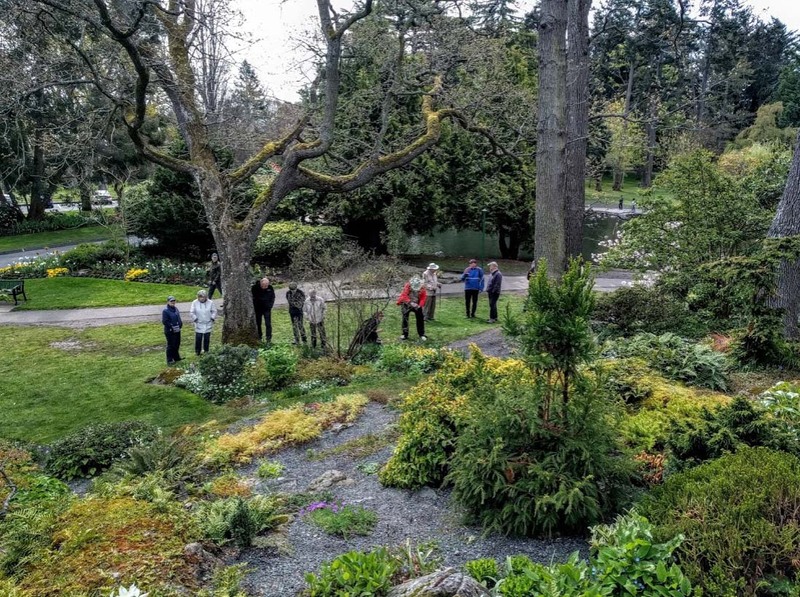 The CanRamblers went to Government House for a special guided tour of the gardens lead by Diane F., who has been a volunteer gardener there for many years. She took us around the Woodland Trail first and then through most of the other gardens and ended at the Cary Mews Tearoom where we had a very nice lunch. The group photo taken by Dave F. at Glencoe Cove point. We met near the end of Houlihan Court and walked through a lane to Houlihan park and crossed across Grandview at the cross walk to the path that leads to Shore Way and Glencoe Cove park.. We enjoyed the view of two of the beaches and the trail through the park before heading up the road to the rest of the walk. See the map showing the route in Terry's photos to see where we walked. Walk # 335 June 13th 2018 A walk along the beach at Island View Beach Park. 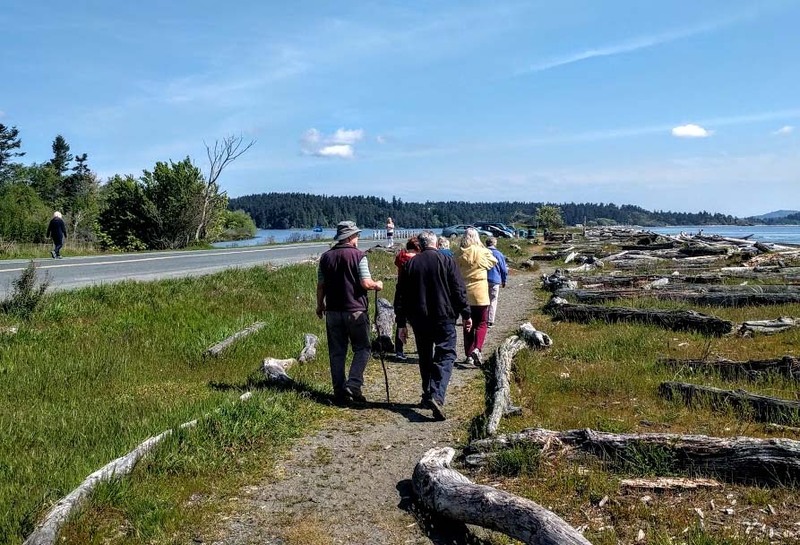 The group heads out towards Sidney on the path at Island View Beach. Seventeen members of the CanRamblers went to Island View Beach on June 13th. The early morning hours were quite rainy, but the weather improved a lot and by the time we got there at 11:am the sun was out and it became quite warm. Most of the group walked to the end of the path to the north end of the beach and back, but those with aching feet and hips had to drop out and find a log to sit on part way on the walk. After the walk we went to Sassy's Family Restaurant near Brentwood and had lunch. With a group of over 14 persons we had a long wait for our lunches, but I guess that is to be expected with a large group. On another warm and beautiful day the CanRamblers met at the top of Blackwood Street off of Hillside Ave. and walked into Summit Hill Park. 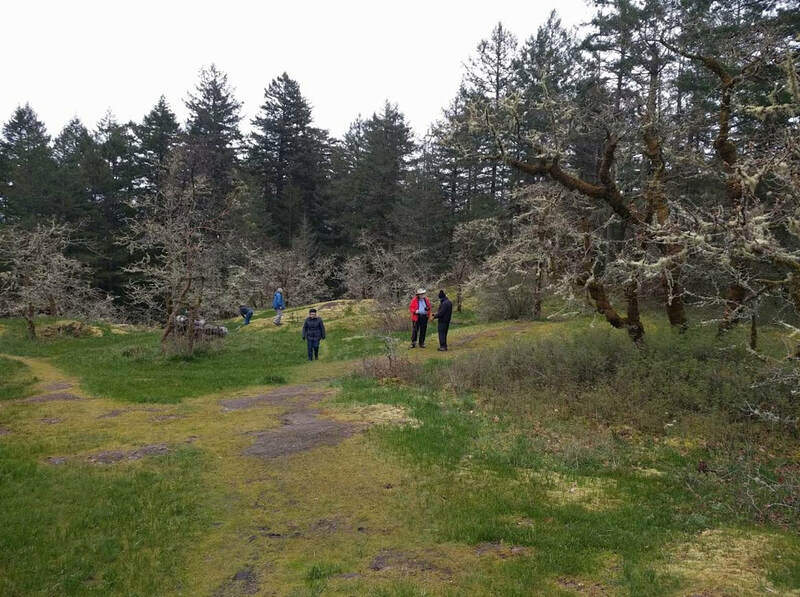 This Garry oak Meadow has a narrow path that goes all around the perimeter of the park and a wide gravel path that goes up to the cell tower and the corner of the old reservoir that was built in 1907. 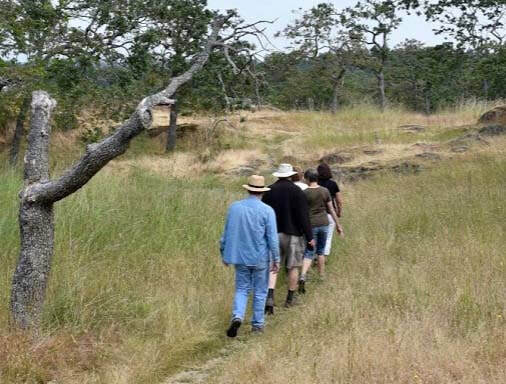 The Lekwungen people used to cultivate and maintain the grasslands of this hill top to enhance the growth of camas lily, their staple root crop and other edible native plants. After the city upgraded the water supply with the Sooke Flow Line in 1915 and this reservoir was not needed. It serves no purpose as a domestic water supply now. We walked down The Rise St. and then across Vista Heights to Blackwood St. and back up to our cars. We went to the Fifth Street Bar & Grill for lunch this time. The wooden walkway down to the beach and the oceanside pier at the Ed MacGregor park. We car-pooled out to Sooke to visit the Ed MacGregor park boardwalk and ocean side pier in Sooke. 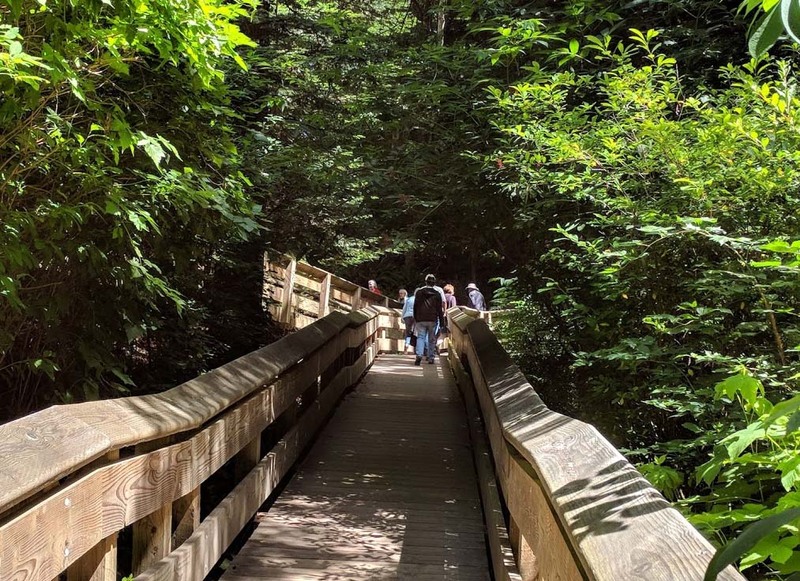 This very scenic park features a bandshell for concerts and a wheelchair friendly series of wooden and concrete ramps that lead down to the oceanside where a very long pier hugs the shoreline along the Sooke harbour. At the far end of the pier there is a trail where the pier goes onto the land. This trail leads back to the beginning of the pier so you can do a round trip. The wooden ramps lead back up to the park area from here. An easy 45 minute walk with a nice sea view. From there we went about a mile further west to Buffy's pub where we had a very reasonable priced lunch with a well earned beer. To finish off the day we stopped at the Sooke Brewing Company to have a quick taste of their Belgian and Northwest style ales, and to meet the brewer, John who is a old friend of Terry's.